Silver Service is a non-denominational service held at The Spire, Farnham Methodist Church Building, South Street on the third Thursday of the month at 3pm. Farnham ASSIST runs the service with help from their volunteer musicians, each month a different clergy member from a Farnham church gives a short sermon. 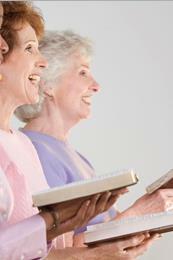 All over 60’s welcome to join us in a short service with well known traditional hymns. Afterwards enjoy tea & cake provided by The Spire Church.